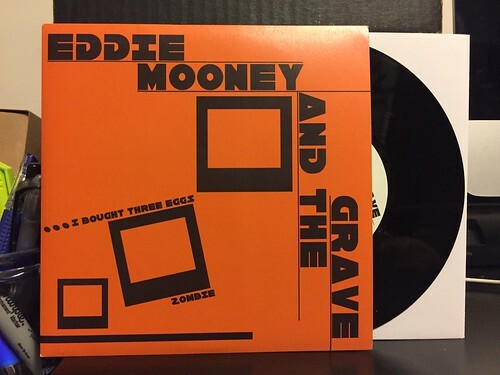 I Buy Way Too Many Records Dot Com: Eddie Mooney And The Grave - I Bought Three Eggs 7"
Eddie Mooney And The Grave - I Bought Three Eggs 7"
I've been getting way more records than usual sent to me to review lately. Granted, that just means a trickle instead of a drip, but It's been a nice way to pad out the lean summer months. It's especially great when I like the record that's sent to me. I will be the first to admit that I'm painfully out of touch with the late 70's/early 80's power pop scene. I know there's all sorts of interesting bands with obscuro one-off singles that people covet like crazy. I have plenty of records to buy without diving headfirst into that, but if something is just dropped in my lap, I'm more than happy to take a listen. This 7" is a reissue of 1978 7" that, according to the liner notes, was released right as the label died so very few actually made it into the world. Well, I'm pretty please that Still Unbeatable records decided to rerelease this one as both of these songs are fun slices of power pop perfection. Rapidly strummed, jangly guitar mixes with minimal, but cutting lead guitar and super catchy vocals. I probably prefer "I Bought Three Eggs" of the two, but "Zombie" is no slouch either. I really dig this 7" and it's funny to think how unlikely it is that I would have ever heard these songs if it wasn't sent to me to review. I guess that's a reason to encourage folks to keep sending in records. This one is great, go buy it right away. I'm Eddie Mooney and I'm chuffed you like my record!